As part of its growth strategy and to allow a smooth transition at the end of the current control period, CML is installing facilities to house large gas powered generators to supply additional power to the National Grid during peak periods. 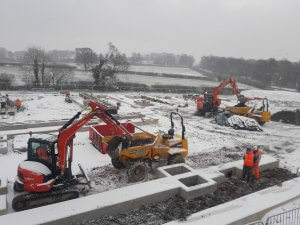 After a tender process of 12 months the projects at Cefn-Mawr in Wrexham and Hinksford in Wolverhampton are well underway with completion expected in May this year. These are the first two schemes of a package of energy generation facilities located throughout the UK. These are CML’s first projects building standby facilities in the energy sector, and the team had to respond as designs were developed during the construction phase. CML’s civil engineering experience and ability proved invaluable in working with the client to resolve design issues and meet demanding programme deadlines. Works included the construction of permanent access roads, connections from the highway, cut and fill operations to level the sites, construction of reinforced concrete structures to house generators and transformers, two kilometers of ducting, 800 metres of drainage and the installation of attenuation tanks to control surface water discharge. All the foundations and supporting infrastructure need to be ready for May deadlines to take delivery of ten 40 tonne generators on each site.